CB: Arpi, tell me about your background. How did you get immersed in tile? Arpi: I’ve always been attracted to handmade or hand-painted artwork. For as long as I can remember, I watched my dad paint regularly after he came home from work. Our home also included Middle Eastern artwork or handmade pieces from Turkey, from which my parents emigrated from in the late 60s, and where I was born. My attraction and immersion into tile flourished when I started working for a trade publication first as an associate editor and then as editor. Witnessing the creativity and the behind-the-scenes manufacturing process in developing new designs and patterns using various materials (ceramic, porcelain, terracotta, glass, mosaics, etc.) fascinated me. Nothing makes me happier than to watch artisans hand-making or hand-painting individual tiles. The same applies to mosaics. Perhaps my background plays a role there, but incredible works of mosaic (recent or antique) leave me speechless. Overall, the focus, vision and passion of any designer or installer who works with tile is something I admire. CB: How did you get immersed online and socially? 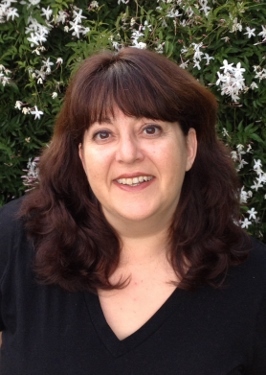 Arpi: My immersion into the social and online communities started with Facebook. I came onto it kicking and screaming at the request of my best friend. After figuring things out there, I moved onto Twitter as a way to keep an eye on breaking news, follow my icons, and so on. Then in late 2008 or early 2009, our publication group’s editors were encouraged to start building upon our magazines’ brands using social media platforms. That was a game-changer! This is something that I embraced because now we could communicate on a one-on-one basis with our fans/followers, advertisers, manufacturers, specific venues, etc. I will always be very grateful to my publisher at the time, Phil Johnson, who not only supported the use of this new media, but encouraged it wholeheartedly within his ranks! Once we were live on Facebook, Twitter and LinkedIn, the world seemed to get smaller. 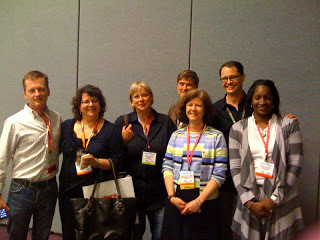 In fact, I represented our publication during the first-ever informal tweet-up held at Coverings in 2010! Being there with you, Bill Buyok of Avente Tile, Paul Anater, Veronika Miller of Modenus, and Zoe Voigt, was surreal. Here we were, a bunch of people who had never met face-to-face, but there were hugs, laughter and friendship shared amongst us! From Meetups and Tweetups: Building Community and Coverings 2010. Pictured from left to right: Paul Anater, Zoe Voigt, Veronika Miller, CB, Bill Buyok and Marilyn Russell. From that point forward, I was more convinced that publications must be more social; they cannot just spew out self-serving posts. Most importantly, being a viable source of information and interacting on any social medium takes time, effort, and a well-thought plan to elevate brand recognition and garner trust. CB: Arpi, which are your favorite social networks and why? Arpi: Wow, this is a tough one. My two favorites at the moment are Pinterest and Instagram. Both are image-based with abundant sharing abilities. For example, on Pinterest, I’m able to “pin” an image to one of my boards. Someone else will come along, either a follower or by doing a search, and repin it onto their boards, where it is seen by their followers, and so on. Instagram is similar to Pinterest except there aren’t separate boards, and the images posted could be anything from a-day-in-the-life type posts, reposts from someone else, or anything that is worthy of sharing. That being said, just as writers and editors need to be diligent with copyrighted material and plagiarism, the same rule applies to the image-based platforms as well. I’m very careful to give proper attribution, and I will take the time to see where the pin originated. If everything checks out, then I will use it. If not, I will move on. For Instagram, I use the RePost app so the person/account it originated from is properly credited. 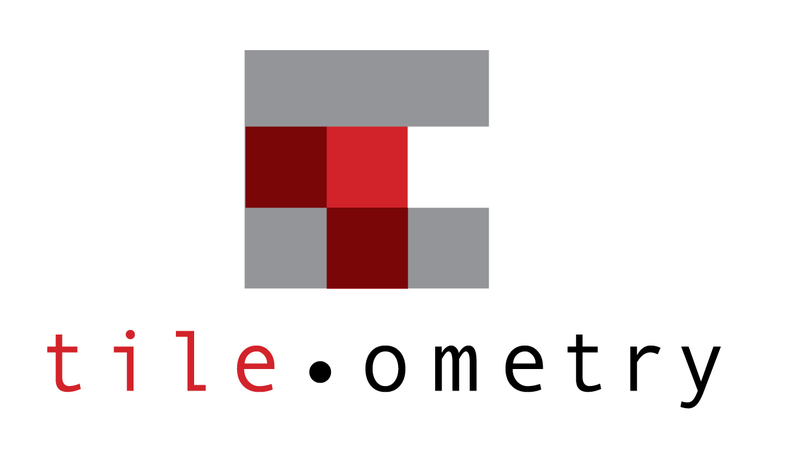 Arpi: Tileometry started nearly three years ago after I left my corporate editorial position. I loved the tile industry and the people that represented it, so in my heart of hearts, I knew I had to do something to continue be a part of it. The name Tileometry was inspired by the combination of Tile + Ometry, a play on words using a suffix commonly found in science and mathematics. 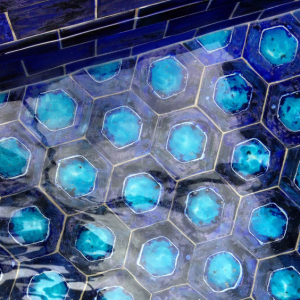 Tileometry’s goal is to showcase how tile, architecture and design have a symbiotic relationship. 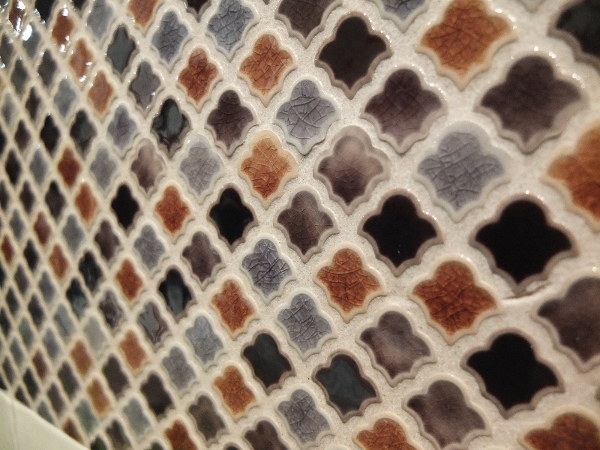 CB: How does tile inspire your social networking for business? Arpi: Tile inspires my social network activity on many fronts. First, tile is relevant in so many disciplines and forms: professional flooring installers, contractors, showrooms, retailers, distributors, and manufacturers; designers; and architects. Tile can be used indoors, outdoors, on floors and on walls, façades, countertops and niches, as an artistic focal point, as a rug, and so on. My goal for Tileometry is for it to serve as a vehicle of inspiration for those who may not have thought of tile as a specified material for a particular project, to help gain exposure for the creativity process of tile artisans and designers, to show how well-made tile is manufactured, and how its sustainable properties lead to greener building choices and practices. Also inspirational are weekly Twitter group chats, such as KBTribechat (for kitchen and bath professional/@kbtribechat), or Interior Design Chat (for interior designers and decorators/@IntDesignerChat). Not only do these hour-long chats share topics of inspiration with their followers and participants, but they also help in gaining new followers, establishing yourself as an expert of your field, and to solidify working relationships. CB: How do you stay organized for social networks? Arpi: Planning ahead and being consistent with posts is crucial. This is easier said than done, but it’s doable. I often schedule important posts to appear on Facebook and Twitter. For Google+ and Houzz, I will spend a few minutes each day scanning for topics and images that I would like to share with others. By the end of the day, I’ve spent about an hour to an hour-and-a-half on social media. Of course, this amount will fluctuate prior to, during, and after tile-related shows (such as Coverings). Live tweeting and posting from a show, as an attendee, exhibitor or blogger, is a MUST! Specific hashtags are created for these events (#Coverings2015, for example) so that everything with that hashtag is grouped when a search is conducted. Essentially, social media networks are the perfect source in establishing brand recognition. Commit to spending an hour a day (30 minutes in the morning, 30 minutes in the afternoon) to your various social media channels. Post at least once a day to keep content fresh. The wonderful thing about having your own business is you can share content with your followers from various sources. I’m not tied to sharing solely from advertisers, or not sharing news-worthy items from competitors. Tileometry shares what interests me, and what I like. In essence, Tileometry is an extension of my personal tastes and persuasions. 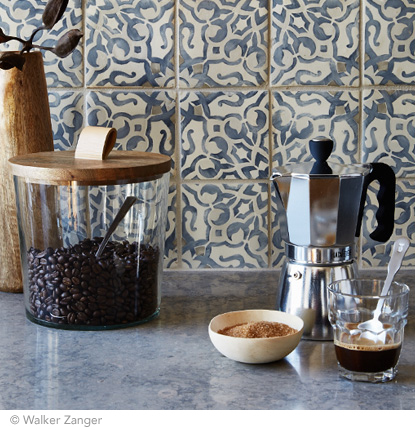 CB: What are the top tile trends you're noticing in the tile industry? Arpi: Well, I was never one to love geometry during my educational years, but 2015 seems to be the year for geometry. 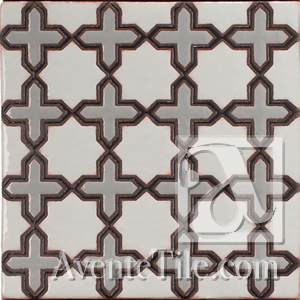 Shapes are seeing a renewed interest in newly manufactured tile designs. I’m seeing everything from hexagons to octagons being heavily showcased, followed by circles, rectangles and mosaics. Sacred geometry has always played a role in ancient Middle Eastern or Middle Eastern-influenced civilizations, so seeing a resurgence in the use of geometrical shapes is refreshing. Also continuing its upward trend is mixed material/pattern use. 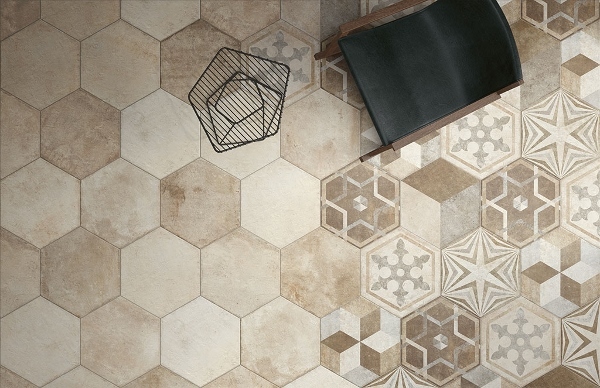 With patchwork tile being hot last year, the trend is continuing in 2015 with porcelain wood-look tiles (using different “species” of wood-look tiles), mosaics, and metals. Glass tile continues its rise as well with the use of better design and manufacturing processes; as does tile that mimics natural stone, especially in larger formats (24”x24” and above). CB: What tips do you have for people just getting started with social networking for business? Arpi: Here are my social media tips. Learn: Take your time to learn by lurking. Follow your favorite people or brands and figure out what practices you like and don’t like with what they do on social media. Connect: Let’s say you have a blog on your website. Link your latest blog post to your company’s Facebook page and Twitter feed, at the very least. You can also link your blog post to Pinterest on a board you named, for example, Our Blog. You can do the same on your Houzz account by starting an Ideabook that includes just your blog posts. Pin images from within the blog post to Pinterest and Houzz. Your one blog post is now connected to various platforms. CB: What about for visual social networks? Arpi: Image is everything! Our attention spans get shorter and shorter, so use images rather than words in certain situations. It’s great that you found a new tile that measures 48”x48”, is an exact replica of honed and filled Travertine, is only 2mm-thick, and comes in a variety of colors. I’d skip the detailed description and instead post an image of your new find with a short caption. Also, images serve to help your followers personify a brand. The photo you took of your employees working on a project, your sneak peek at a new tile line, the image a client sent you after installing your tile in their home or business, or even what you do during your down time – these are all things that show you or your company’s various sides. CB: Arpi, what are your favorite sources of inspiration? Arpi: Industry events, Twitter chats and blogs are my inspiration for content development, writing and sharing. There’s a list of blogs that I follow. Some are updated more often than others, but they all offer inspiration to any one reading them. Pinterest, Houzz and Instagram serve as visual inspiration for social media posts, both personally and professionally. Of course, nature and architecture serve inspiration on a different level all together! CB: Arpi, how can you be reached?